Dr. Gerba has made quite a name for himself by studying public toilets and other places where germs lurk. In 1975, Gerba published a scientific article describing the phenomenon of bacterial and viral aerosols due to toilet flushing. When this aerosol of contaminated water is ejected into the air, it lands on everything in the bathroom, including your toothbrush. According to Gerba, this isn't just another scare tactic to get men to put the top down. During the study, gauze pads were placed around the experimental bathroom. Close-up photos of the germy ejecta, according to Gerba, looked like "Baghdad at night during an air attack." 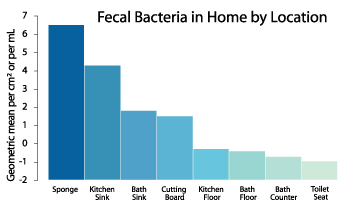 The study showed that significant quantities of microbes floated around the bathroom for at least two hours after each flush. Gerba discovered that a lot of virus fell on those gauze pads. Feeling the least bit squeamish? You might want to skip this stroll down germ lane, with UA Professor Charles P. Gerba at the helm. With all the medical and technological advances in the last century, shouldn’t germs and infectious disease be a thing of the past? Not so fast. One hundred years ago, infectious disease was the leading cause of death. By 1980, it had fallen to number 5, but about 10 years ago, it managed to climb its way up to number 3. And, according to Professor Charles P. Gerba of the University of Arizona Department of Soil, Water and Environmental Science, it’ll most likely find its way back to the number 1 spot. “Germs follow us around all day. They are opportunists,” says Gerba, who’s been on such shows as Dateline, 48 Hours, the Today Show, 20/20, and Good Morning, America. Some of the reasons why infectious disease will move up the chart include the globalization of commerce and travel, changes in drinking water and food supply production, and evolution — a genetic reassortment, as Gerba calls it. How does a UA professor get involved in studying toilets in the first place? 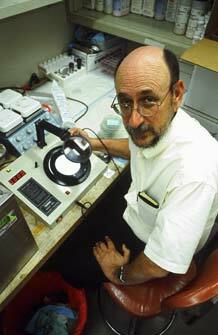 Gerba was an assistant professor for eight years at Baylor College of Medicine, where he studied waterborne diseases. He worked with Joseph Melnick, an international leader in the identification and control of virus diseases and one of the founders of the field of virology. He led the team that developed thermo-stabilized live polio vaccines, making it possible to immunize millions of people in countries without deep-freeze storage facilities. Melnick was right. Gerba has made quite a name for himself by studying public toilets and other places where germs lurk. In 1975, Gerba published a scientific article describing the phenomenon of bacterial and viral aerosols due to toilet flushing. When this aerosol of contaminated water is ejected into the air, it lands on everything in the bathroom, including your toothbrush. According to Gerba, this isn’t just another scare tactic to get men to put the top down. During the study, gauze pads were placed around the experimental bathroom. Close-up photos of the germy ejecta, according to Gerba, looked like “Baghdad at night during an air attack.” The study showed that significant quantities of microbes floated around the bathroom for at least two hours after each flush. Gerba discovered that a lot of virus fell on those gauze pads.